1. This is an iconic anti-Vietnam War poster. The colour photo of the My Lai Massacre was taken by U.S. combat photographer Ronald L. Haeberle on March 16, 1968. In this Massacre by U.S. troops between 304 and 504 unarmed civilians were killed and some women and girls were raped. 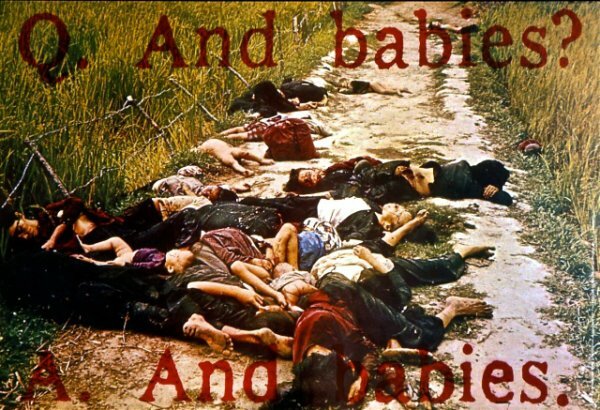 The photo shows about a dozen dead and partly naked South Vietnamese women and babies in contorted positions, all killed by US soldiers. They are laying together where they were massacred on a dirt road. 2. The picture is overlaid in semi-transparent blood-red lettering that asks along the top "Q. And babies ? ", and at the bottom answers "A. And babies." This disturbing quote is a question and its answer, taken from a CBS News television interview with U.S. soldier Paul Meadlo who participated in the massacre. Q. So you fired something like sixty-seven shots? Q. And you killed how many? At that time? A. Well, I fired them automatic, so you can’t - You just spray the area on them and so you can’t know how many you killed ‘cause they were going fast. So I might have killed ten or fifteen of them. Q. Men, women, and children? A. Men, women, and children. 4. The poster was created by the Art Workers Coalition (AWC), a group of New York City artists who opposed the war. The poster became a focus for the outrage that so many people around the world felt about the U.S.A.’s war in Vietnam. And the My Lai Massacre became representative of the many war crimes committed in Vietnam. 5. The poster was produced by AWC members Irving Petlin, Jon Hendricks and Frazer Dougherty along with Museum of Modern Art members Arthur Drexler and Elizabeth Shaw. The Museum of Modern Art (MoMA) in New York had promised to fund and circulate the poster, but after seeing it, decided not to finance the project at the last minute. 6. MoMA's Board of Trustees included Nelson Rockefeller (more on him in paragraph 16 here) and William S. Paley (head of CBS), who reportedly "hit the ceiling" on seeing the proofs of the poster. Both were "firm supporters" of the war effort and backed the Nixon administration. MoMA’s attempt at a ‘justification’ for this decision was one of those intellectual and moral failures for which some parts of the art world have become famous (… and it still happens). The official reason, stated in a MoMA press release, was that the poster was outside the "function" of the museum (whatever that means !). 7. 50,000 of the posters were printed by New York City's lithographers union. In a further protest of MoMA's decision to pull out of the project, copies of the poster were carried by members of the AWC into the MoMA and unfurled in front of Picasso's painting ‘Guernica’ (here), which was on loan to MoMA at the time. 8. As you may know, ‘Guernica’ is Picasso’s depiction of the tragedies of war and the suffering it inflicts upon innocent civilians. It is strange, that MoMA’s finest minds at the time claimed that ‘Q. And Babies…’ was outside MoMA’s “function” whilst ‘Guernica’ was not ! 9. The failure of the U.S. military and legal systems to secure justice for the victims and to punish those who carried out this appalling war crime has left a permanent stain on the reputation of the U.S.A. Of 26 men initially charged, only one was convicted. Lt. Calley was found guilty of the premeditated murder of not less than twenty people, and sentenced to life imprisonment. However, only two days later, President Richard Nixon instructed that Calley be released and put under house arrest, which eventually lasted for only three and a half years. That was the only conviction and the sum total of the criminal punishment handed out by the U.S.A.
10. Through this poster, and many other cultural responses, the My Lai Massacre has become emblematic of US war crimes in Vietnam. Whilst this event is known around the world as the 'My Lai' Massacre, in Vietnam it is known as the 'Son My' Massacre as that is the local name for the village.